Value engineering alternate, complex global phasing, innovative launching, precast deck, and demolition. 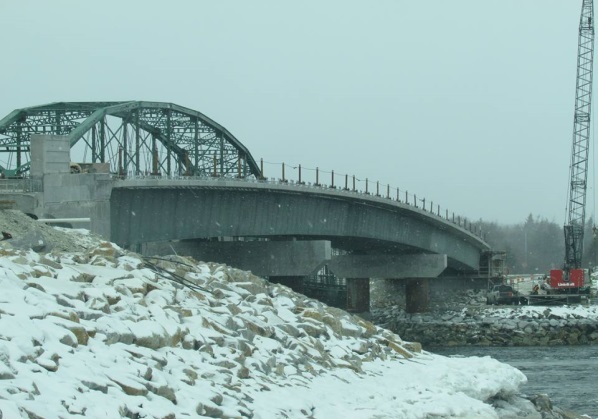 Originally tendered as a design-bid-build project, HEC initially provided advice during the tender period with respect to the construction engineering (cofferdams to construct the deep foundation piers and abutments for the parent design) and the girder erection. During these preliminary designs, HEC identified significant concerns regarding the constructability of the parent design, including the ability to construct the deep foundation piers and abutments in the rapid flowing water underlain by a boulder and cobble substrate that made driving of piles and cofferdams extremely difficult. 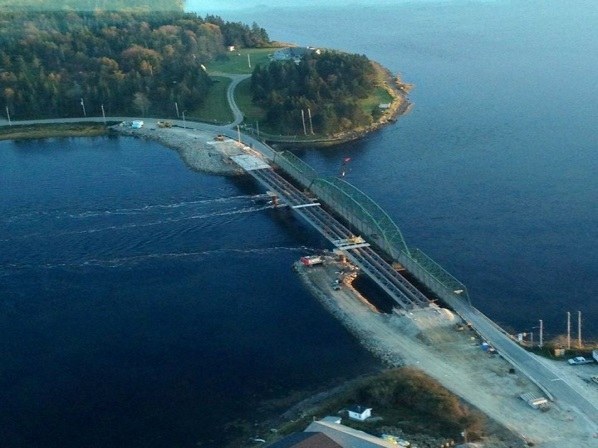 The proximity of the new piers to the existing bridge foundations, which was to remain in service during construction, was also problematic since installation of the necessary cofferdams required trenching to remove the cobbles and boulders prior to driving the SSP cofferdam. This initial trenching would have likely undermined the existing gravity based shallow foundations, resulting in a major safety concern with the tendered design. The erection of the large / stability sensitive variable depth plate girders was also quickly determined to be cost prohibitive during the tender period. The large current in the channel made the use of a barge supported launch impractical, and the size and weight of the girders made lifting the segments off a trestle costly. To facilitate completion of the base bid (to determine the degree of savings expected from an alternate value engineering design) HEC did complete a preliminary design of an innovative, yet costly, launch design for the variable depth plate girders. The costly aspects of the design centered on the fact that a rolling hanging support from the top flange of the girders was required since rolling the girders along the bottom flange could not be achieved due to the steep bottom flange slopes near the pier regions of the girders.